Join Marshal Elliott and CLC Members for a discussion on the Marshals service and the programs he has initiated such as the Northern Ohio Violent Fugitive Task and Force Fugitive Safe Surrender Program. He’ll also discuss how the Marshals work collaboratively with other law enforcement and outside agencies. Are you a graduate of a CLC program but not a Member? Join today to get access to the Brown Bag series, as well as other Member perks. Attendees are invited to bring their lunch. Registration for this event is closed. Contact Christian Swol (216-592-2276) with questions. 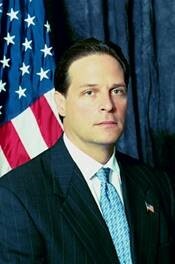 In March 2003, Peter J. Elliott was appointed by President George W. Bush as United States Marshal for the Northern District of Ohio after being unanimously confirmed by the United States Senate. In 2009, Marshal Elliott was officially retained by President Barack Obama and in 2017 Marshal Elliott was again officially retained by President Donald J. Trump to continue his service. Marshal Elliott is the longest serving United States Marshal in the history of Ohio. Marshal Elliott is responsible for the management, administration, and direction of operations throughout the district, which consists of the northern forty counties. Responsibilities include leading and directing a staff whose core missions include security and protection of the United States Courts, criminal investigations, fugitive apprehension, execution of federal court orders and other law enforcement activities. Marshal Elliott grew up in Lakewood, Ohio. He graduated from St. Edward High School, earned an Associate’s Degree from Cuyahoga Community College and graduated from Capital University with a Bachelor’s degree in Public Administration. He is a third generation law enforcement officer whose law enforcement career has spanned over 35 years. He worked undercover narcotics then followed in his father’s footsteps and became a Deputy United States Marshal. He later became an ATF Agent investigating terrorism, firearms and explosives cases. Marshal Elliott has created many new and innovative programs to further the mission of the US Marshals Service, to increase collaboration between federal, state and local agencies and to involve the community in making their streets safer. Most notably, Marshal Elliott created the Northern Ohio Violent Fugitive Task Force which has arrested over 45,000 fugitives since its inception in 2003, and now includes over 125 partner agencies and more than 350 law enforcement officers. In 2005 Marshal Elliott created the Fugitive Safe Surrender Program in which law enforcement partners with the local faith based community and encourages fugitives to surrender at a local place of worship. This highly successful program has been duplicated across the country and has led to the peaceful surrender of over 65,000 fugitives. In 2015 he created the Cold Case Unit that tracked down and arrested the longest running fugitive in the history of the United States Marshals Service, captured after 56 years on the run. He has partnered with local media outlets to highlight the most wanted fugitives of our area and has established anonymous tip and text lines for tipsters to submit information on fugitives. Marshal Elliott has been recognized with numerous national and local awards for his work, including the “Distinguished Service Medal” from the Bureau of Alcohol, Tobacco, Firearms & Explosives, “Investigative Excellence Award” from the Federal Law Enforcement Officers Association, “Law Enforcement Officer of the Year” from the Cuyahoga County Prosecutor’s Office, “Leadership Beyond the Standard Award” from the Director of the Marshals Service, “Top Cop” by the National Association of Police Organizations, “Police Officer of the Year” by the Cleveland Police Memorial Society, the “Outstanding Leadership Award” from the Retired Ohio Police Chief’s Association and the “Outstanding Public Service Award” from the Cuyahoga County Mayors & City Managers Association. Marshal Elliott was named one of the “50 Most Influential People” in Northern Ohio by Cleveland Magazine and has been honored by members of the United States Congress on numerous occasions for his innovations and success.